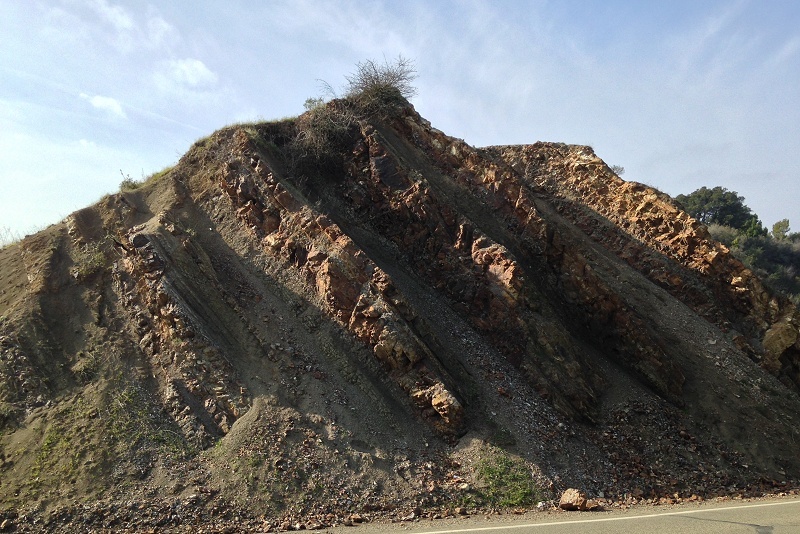 Much of Oakland’s high hills consists of our local piece of the Great Valley Group, the colossal set of sedimentary rocks that runs the length of the Central Valley along its western wall. (How our piece got over here is, as they say, poorly constrained.) 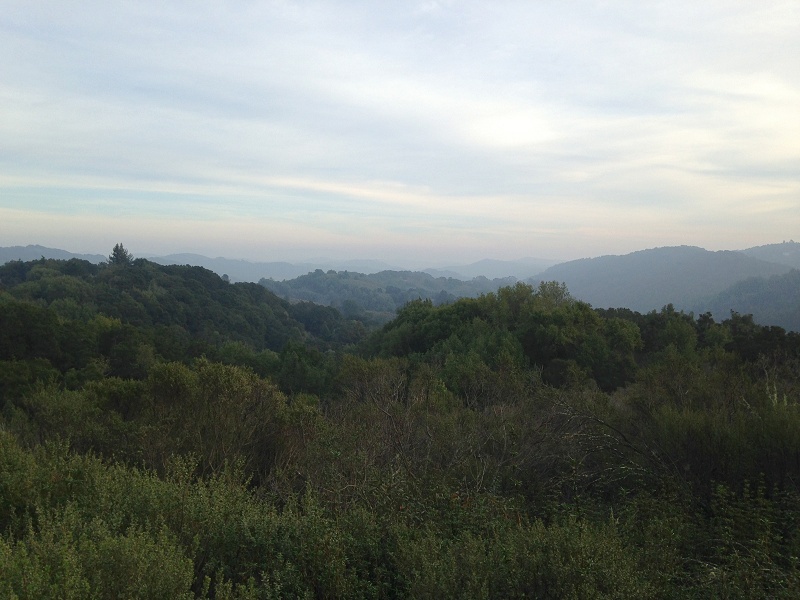 The group is well exposed in Shepherd Canyon and points south, and it continues on the far side of the hills as far as the Upper San Leandro Reservoir. 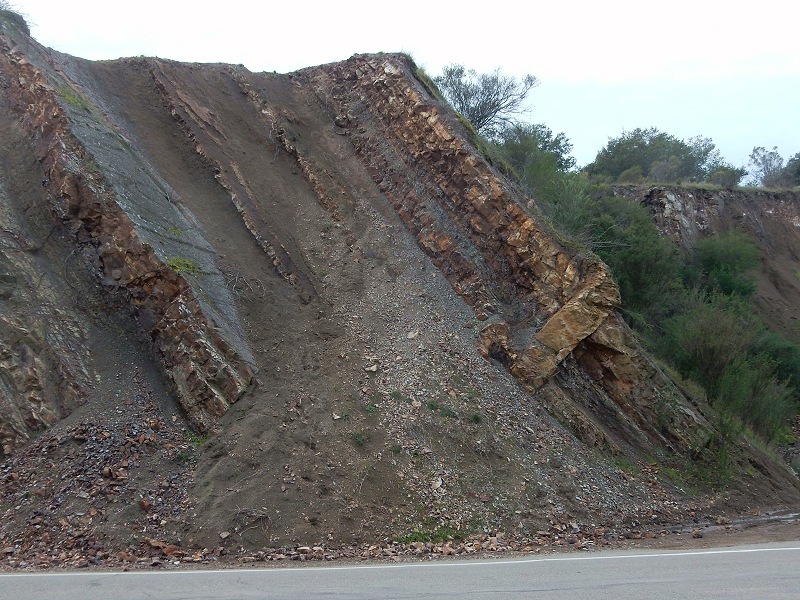 There the Redwood Canyon Formation, the upper unit of the group, is overlain by a little rock unit called the Pinehurst Shale. 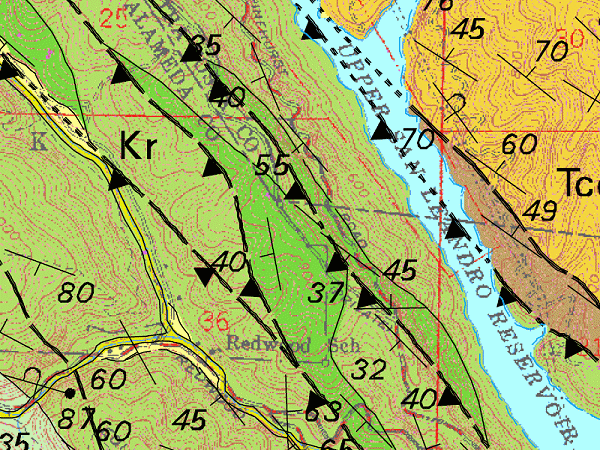 On the geologic map, it’s the slices of darker green nestled amid the Redwood Canyon Formation (labeled Kr). This exposure shows strong bedding, but it’s all shale — rock with little material coarser than clay size. Some of it’s soft claystone that crumbles and erodes easily. 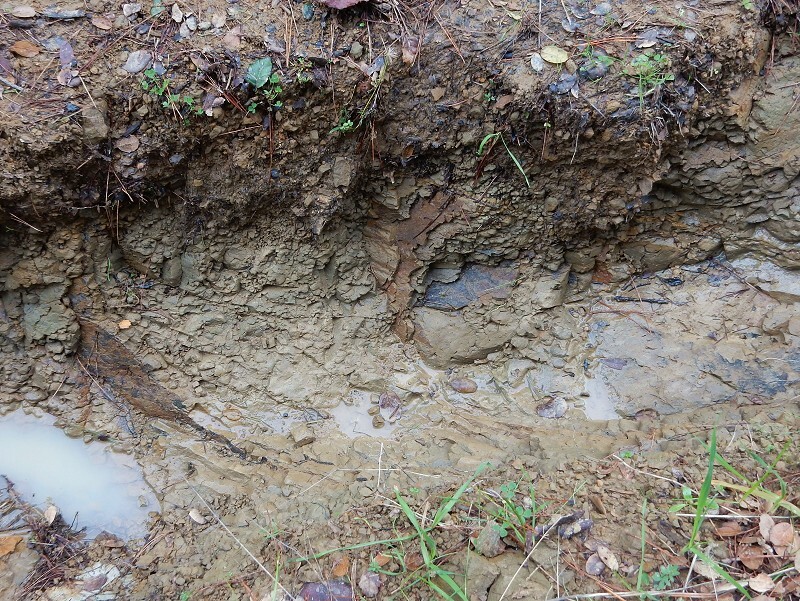 Here it is in a rain-carved rut in the fire road that leads into the park. 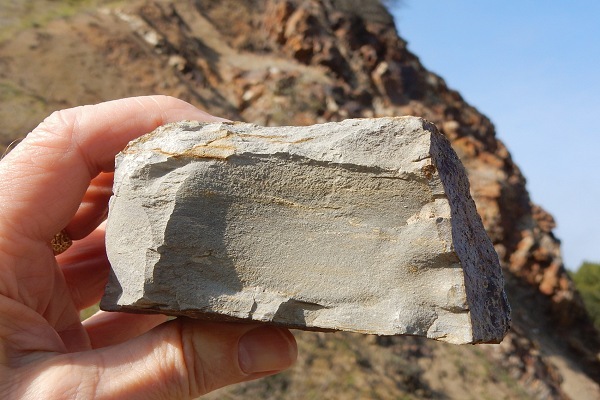 Other parts of the Pinehurst Shale are very hard and resistant because they contain a goodly share of silica. 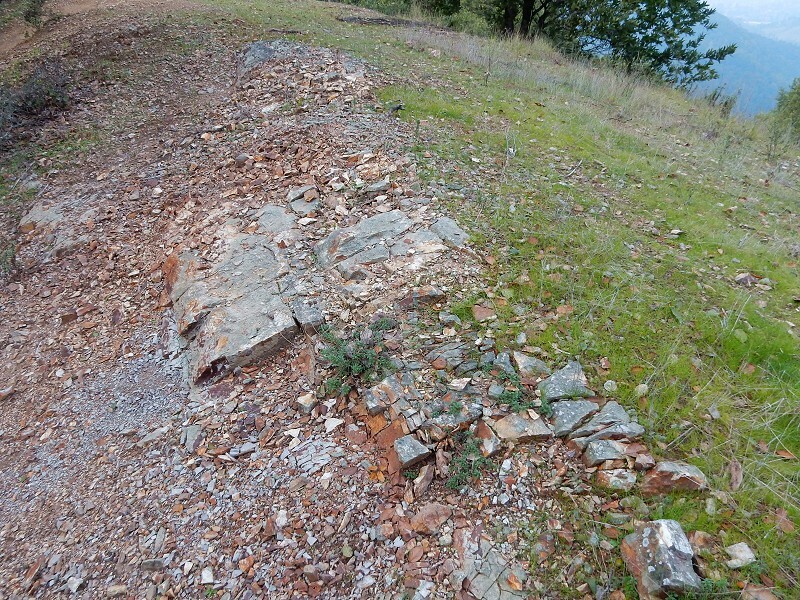 Here’s what that siliceous shale looks like in outcrops along the trail . . . 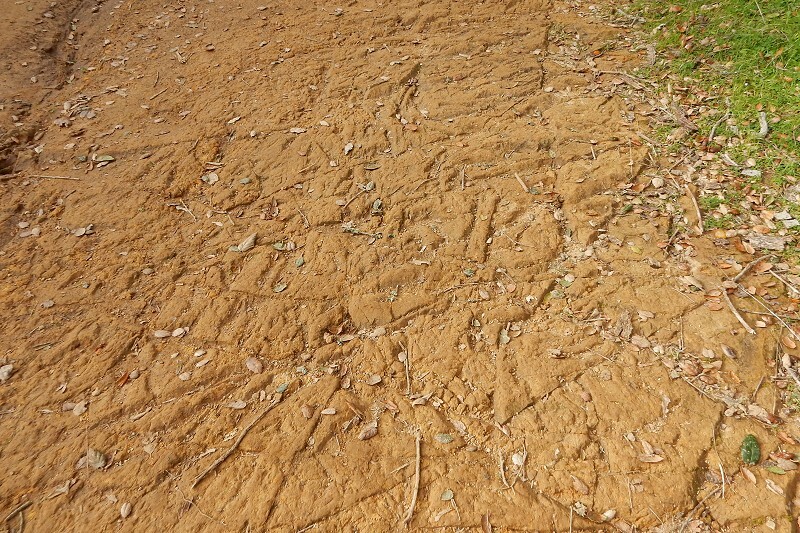 Farther up the trail, the shale gives way to siltstone of the Redwood Canyon Formation. It’s quite a dramatic change. Both of these rock units contain microfossils from the Campanian Age, making them somewhere around 75 million years old. 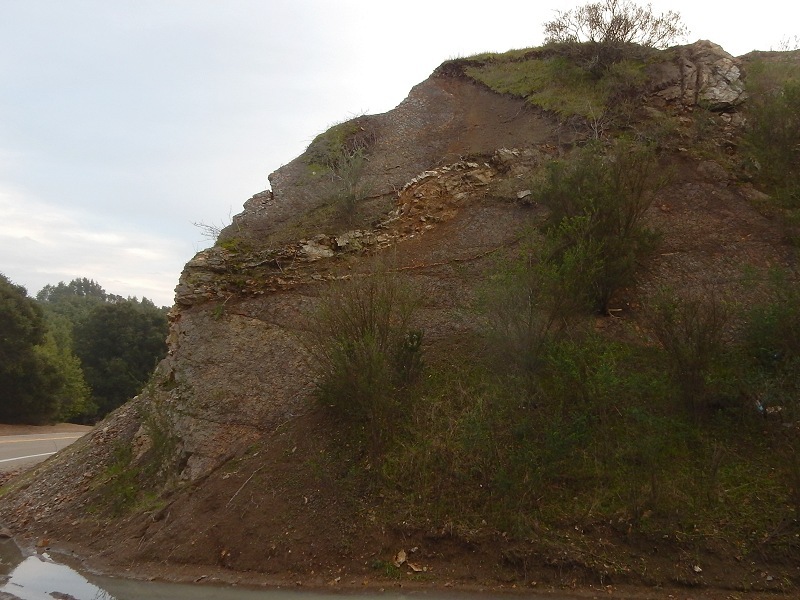 Whatever once lay above them has been removed by faulting, leaving a gap of maybe 60 million years between them and a little ribbon of Sobrante Formation across the reservoir on EBMUD land. There’s another cool thing here. Here’s the rock just to the right of the top photo. See that big chunk of rock by the right edge, sticking out crosswise against the bedding? That is a sedimentary dike. It marks a place where once upon a time, before this rock was fully solidified, an imbalance in fluid pressures caused the one layer to force a crack upward through the overlying layers and squirt into it. Usually dikes are something you expect to see in lava beds, or producing “sand blows” on the ground after large earthquakes. This next shot is taken from the right side, looking at the top of the dike. An exposure like this, on a roadcut, is usually fair game for grooming by pulling out the shrubs and sweeping away some of the rubble. I do that here and there during my outings, but this spot looked a bit chancy. I contented myself with pulling up some young French broom plants. Now’s the best time of year to do that, when the soil is saturated. If we all did a little of that, it would help fight the invasive problem. The land is worth the effort. Visiting our parklands can take you very far away. This entry was posted on 23 January 2017 at 8:03 am and is filed under Oakland rocks. You can follow any responses to this entry through the RSS 2.0 feed. You can skip to the end and leave a response. Pinging is currently not allowed. Thank you for another great photo essay. I’m looking forward to visiting the Pinehurst Staging area. Great photos. If these were in some parts of SoCal, CalTrans and/or the various municipalities would landscape everything to remove any vestige of those “icky-looking” rocks, dirt and stuff. Well, it is a landslide hazard. This one is in progress just uphill from that exposure.